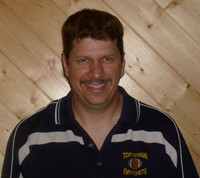 A graduate member of the Tomahawk High School Class of 1982, participating in football, basketball, & track for four years along with baseball for three seasons. Jeff's hard worke paid off as he earned thirteen letters in his fifteen sporting seasons, lettering four times in track and three times in football, basketball, and baseball. Jeff received two All-Conference Honorable Mention Awards in football, one Honorable Mention Award in basketball, and Second Team All-Conference in track, along with one Honorable Mention Award in baseball. He was also a Channel 7 All Star his senior year while helping his basketball team to a regional crown during his junior year. Jeff was a regional champion in the 400m achieving a new school record time of 51.8 seconds. He then broke his school record when he finished third at sectionals with a time of 51.7 seconds. Jeff was a valuable part of his track team during his senior year as they became regional champions. In baseball, he was a part of three regional titles, one sectional title, and one trip to the state tournament his sophomore year. After high school, Jeff played football for two years at Winona State in Minnesota. He currently works as lead paint engineer for Harley-Davidson in Tomahawk and has given much back to his community as a middle school football coach and high school track coach.